Cut a piece of cereal box cardboard about a half inch all around larger than your stamp. 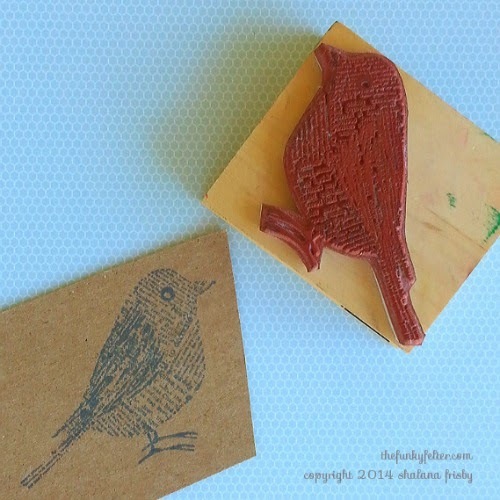 Coat your stamp well and stamp the back or non-print side of the recycled cardboard. Cut out around the stamped areas edge. On some I left about an eighth of an inch space around the edge and on some I cut right next to the stamp - whatever was easiest and looked best. Then I used my ink pad to rub along the edge all around making a solid outline. I also used Tim Holtz Distress Markers to color some of the images and highlighted areas. At this point, well, you're really done. For tags, punch a hole and add a thin ribbon or yarn tie. Or use to decorate cards and other paper crafts. I don't recommend using these in your scrapbooks next to pictures because of the acidic nature of the recycled cardboard. You could laminate and seal them though if you want to go that route. As for me, I just really enjoy the process of making these little embellishments. It is relaxing to sit, cut, stamp and color (especially since I like using my Distress Markers so much!) - similar to the joys of being a child and being in the moment of creating something fun and whimsical. I make one after another of these little stamped shapes and put them in a plastic baggie for destinations yet to be determined. And that's perfectly okay. 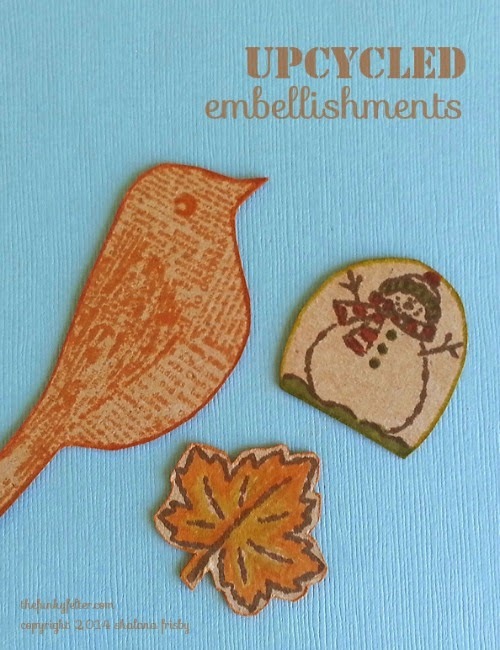 After many years of working in a deadline driven industry like publishing where everything is riding on perfect physical results, it is nice to be able to churn out funky little stamped snowmen, birds and the like without caring for its final destination - the process is totally freeing to my hyperactive, creative mind. Happy crafting everyone!